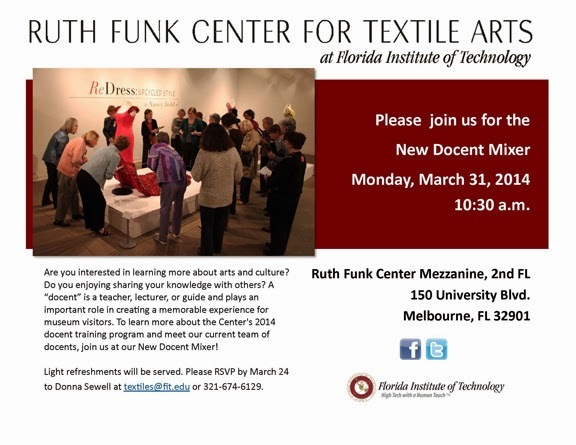 MELBOURNE, FLA. — Florida Institute of Technology’s Ruth Funk Center for Textile Arts, anticipating the April launch of its docent training program, will host a New Docent Mixer for interested participants on March 31 at 10:30 a.m. in the Funk Center’s second-floor mezzanine. “The mixer will be a great chance to chat with some of our current docents and find out why the Ruth Funk Center is a great place to volunteer,” said Donna Sewell, the Center’s manager of visitor services. Anyone with an interest in the arts and who enjoys working with the public may serve as an advocate for cultural enrichment by becoming a docent at the Center. The training program will present an intimate look at the world of fiber arts through unique demonstrations and lectures. Training officially begins April 21 at 9:30 a.m. and continues each Monday from 9:30 a.m. to noon through June 16, with the exception of Memorial Day. Those interested in attending the mixer, which will include light refreshments, are asked to RSVP to Sewell at dsewell2011@fit.edu or call (321) 674-6129. The Ruth Funk Center is next to Evans Library on the Florida Tech campus, 150 W. University Blvd. in Melbourne. Admission is free. The current exhibit, Tying the Knot: Global Wedding Costume and Ritual,continues through April 26. For more information, visit the Center’s newly redesigned website at http://textiles.fit.edu.